Ada (Holly Hunter) – mute since birth – her nine year old daughter Flora (Anna Panquin) and her piano arrive to an arranged marriage in the remote bush of nineteenth century New Zealand. Of all her belongings her husband refuses to transport the piano and it is left behind on the beach. Unable to bear its certain destruction, Ada strikes a bargain with an illiterate tattooed neighbour (Harvey Keitel). She may earn her piano back if she allows him to do certain things while she plays; one black key for every lesson. Winner of three Academy Awards (Best Actress for Holly Hunter, Best Actress in a Supporting Role for Anna Panquin and Best Screenplay Written Directly for the Screen) and the Palme D'Or at Cannes in 1993, and the film that really brought writer-director Jane Campion to international prominence, The Piano is an extremely evocative portrayal of repression and desire, universally acclaimed, it is still as powerful and resolute now as it was when first released. The film also features Sam Neill and Kerry Walker and boasts a score by Peter Greenaway fave Michael Nyman and Oscar-nominated cinematography by Stuart Dryburgh (Once Were Warriors, Lone Star, The Portrait of a Lady). 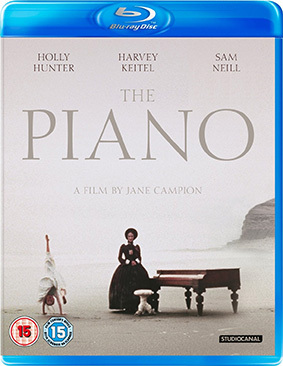 The Piano will be released on UK Blu-ray on 20th Januaruy 2014 by Studiocanal at the RRP of £22.99.